In a post-game interview last night, New Orleans Saints quarterback Drew Brees said, "It played out even greater than I ever could've imagined." He was talking about his amazing achievement on the field: In the second quarter victory of the Saints game against the Washington Redskins, Brees became the NFL's all-time passing leader with a 62-yard touchdown pass to receiver Tre'Quan Smith. 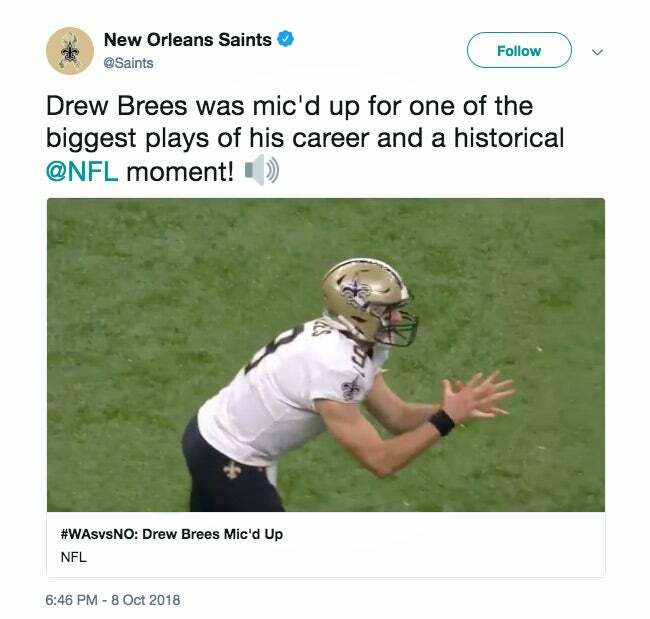 The NFL stopped the game as the crowd and Brees’ teammates alike roared to recognize his incredible accomplishment . (Peyton Manning previously held the record with 71,940 yards.) Brees hugged teammates on the field and shouted out to the fans before hitting the sidelines to hugs and kiss his wife, Brittany, and his four children, among others. Brees was mic'd up for the game and, in one powerful moment, was heard telling his kids, "You can accomplish anything in life you're willing to work for, right?" Watch the video, feel the chills, and get to work!